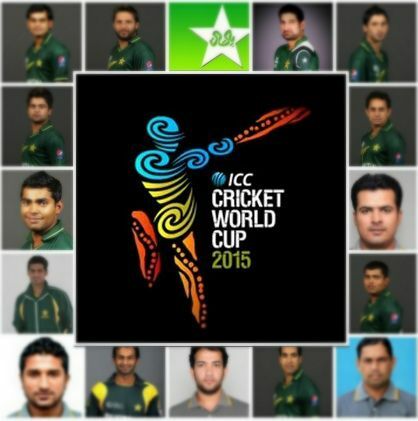 Cricket World Cup 2015 is just around the corner and Pakistan are starting to get into form as usualy closer to the world cup, PCB has announced the provisional 30 man squad which include even the suspended Saeed Ajmal but his inclusion in the last 15 depends on his action clearence and match fitness. Following is the 30 man squad and our prediction on which of the 15 players will make it to the final 15 heading down under. Pakistan will be playing and ODI series against New Zealand in UAE while you will be reading this article, once the series is finished everyone will have a pretty much a good idea which 15 players are heading to world cup. plus pcb has already announced the pool of 30 players from which they will consider the final 15. Has been in great form in 2014, he is a proper limited over player who scores are almost run a ball and can pace his innings according to the match. Playing on australian wickets will be tough and he is kind of batsman who when in form score big consistently. His performances in 2014 are more than enough to a merit a place in starting XI for Pakistan. Sarfraz Ahmad has been breath of fresh air as far as Pakistan batting in concerned, he scored couple of hundreds against New Zealand and many expert beleive he is the best wicket keeping batsman paksitan ever had (yeah a big statement). His technique and temprament to play according to situation will surely get him place ahead of Kamran Akmal in the playing XI. He should open with Ahmad Shehzad as the other option Muhammad Hafeez is likely to suffer on bouncy pitches. If he is in decent form in one day cricket he must play at the number three position and try to do anchor role for the team. Younis Khan had a staller of a season in test cricket scoring more than 700 runs against Australia and New Zealand. Selectors opened the door for him in ODI cricket after some new comers struggled to keep their place in ODI format. He is someone who needs to be in the team even though all Pakistan cricket fans know that its hard to expect anything of note from Hafeez in terms of a batting at the bouncy fast tracks of australia-new zealand. But his bowling is a major factor in him playing in the team and if he can keep getting those odd 20 to 40 runs he will pretty much justify his place in the team. Probably the most talented batsman in the lineup, a match winner on his day. Only downer is he is very inconsistant and a bit of Afridi when it comes to batting. He should play in the team as proper batsman and wicket keeping should go do Sarfraz maybe that way he will take more responsibility in his batting approach. The captain, the savior and the man of crisis. Misbah ul Haq is the best choice to lead the team and his presense in batting lineup is very important for the team. He should use himself down the order and try not to waste too many balls. We all saw in that fastest test hundred, what he can do when he in the mood. Afridi is a match winner if not with the bat than with his bowling. I can see him playing his last set of international match in world cup 2015 as he will probably retire after the world cup. If paksitan has any chance of going far in the competition, he is their best bet. No 7 position is good for him and I genuinely feel he owe us a good batting showing in world cup having failed in last 4 world cups. Junaid Khan will be a very important player for Pakistan in the world cup, he will generate a bit more pace on those pitches and he will come handy alongside the other giant Muhammad Irfan. I can’t wait to see him bowl on austrial wickets, I think if he uses height to his advantage he can be very hard to play against. His job will be to get those couple of early wickets to get the opposing team in the bad start.